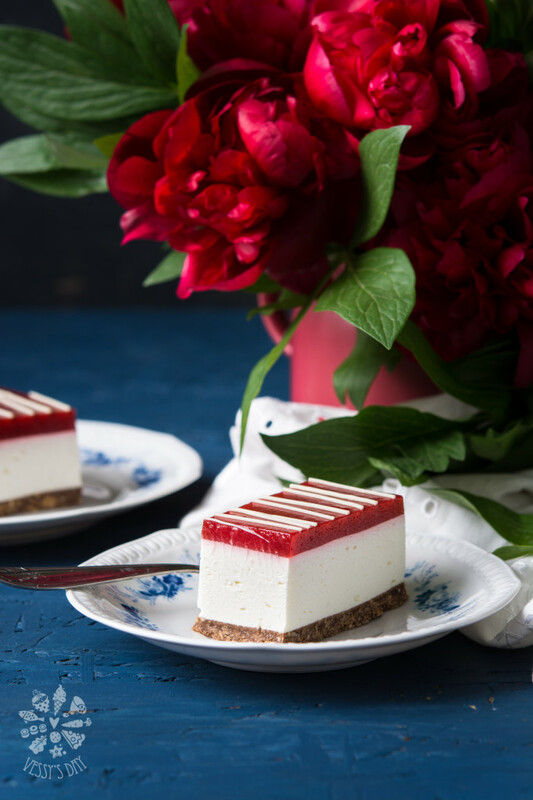 This easy no-bake cheesecake recipe is perfect for the summer – it’s creamy, sweet, refreshing, fruity and has a little bit of chocolate for those who don’t appreciate non-chocolate-y desserts. Please, don’t get scared by the long list of ingredients and instructions. This recipe is super easy to make, I just like to share detailed instructions for your guys. 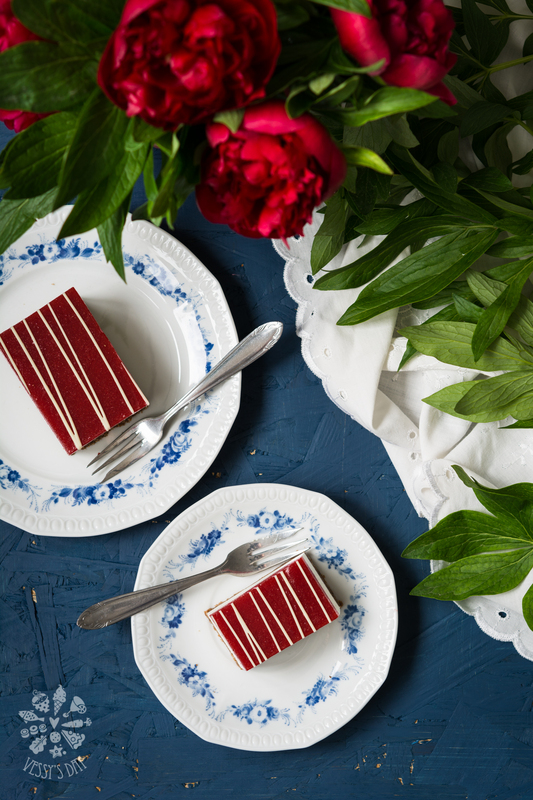 The only thing you need to be careful with in this recipe, is the gelatine. I always cook it over water bath, so I can be sure it’s not overheated. 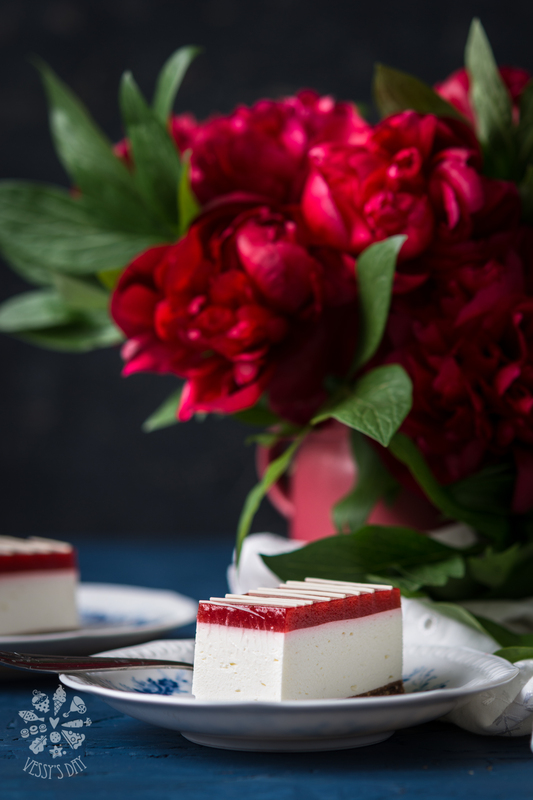 In case you are not the biggest fan of gelatine, you can make this recipe without it, but you will have to serve it in a glass or jar, since gelatine helps this cheesecake hold it’s shape so perfectly. Other than that, recipe is pretty straight forward and quick to prepare. Grease a non-stick 20 cm (8 inch) cake springform with removable sides (or other springform of your choice). Mix biscuits (could be chocolate or any other kind you prefer) with butter, powder sugar and cocoa in a small bowl – the mixture should look like moist sand/crumbs. Transfer to the prepared springform and spread evenly over the bottom of the pan. Use a flat-bottomed glass to press the biscuit mixture over the bottom. Cover with plastic wrap and place in the fridge for 30 minutes to chill. Place 10 grams (1 sachet) of gelatine in a small heatproof bowl with 6 tablespoons water and let it sit for a few minutes. Place bowl of gelatine over a small saucepan with simmering water. Let gelatine heats until liquid smooth, crystal clear like water, only little yellowish. Set aside to cool for a few minutes. In the meantime, beat cream cheese, powder sugar, vanilla and orange zest in a large bowl, until smooth. Add whipped cream and gently stir to combine. Add gelatine and beat for a minute to fully incorporate. Pour cream cheese mixture over the biscuit base and even the top with a spatula. Place strawberries, lemon juice and sugar in a small saucepan. Cook over medium heat for about 10 minutes, or until soft. Place cornstarch in a small bowl. Spoon out a little bit of the strawberry juices from the saucepan and add to the cornstarch.Stir until thin paste forms. Reduce heat to medium and pour the cornstarch mixture into the saucepan. Stir constantly for about 3-5 minutes or until strawberry mixture thickens. Remove from heat and puree finely. Strain through a fine mesh and set aside to cool off a bit. In the meantime, place 10 grams (1 sachet) of gelatine in a small heatproof bowl with the water and let it sit for a few minutes. Place the bowl of gelatine over a small saucepan with simmering water. Let the gelatine heats until liquid smooth, crystal clear like water, only little yellowish. Add gelatine to the strawberry sauce and stir to completely incorporate. Make sure strawberry sauce is not too hot when you add the gelatine, or it will loose it’s qualities. 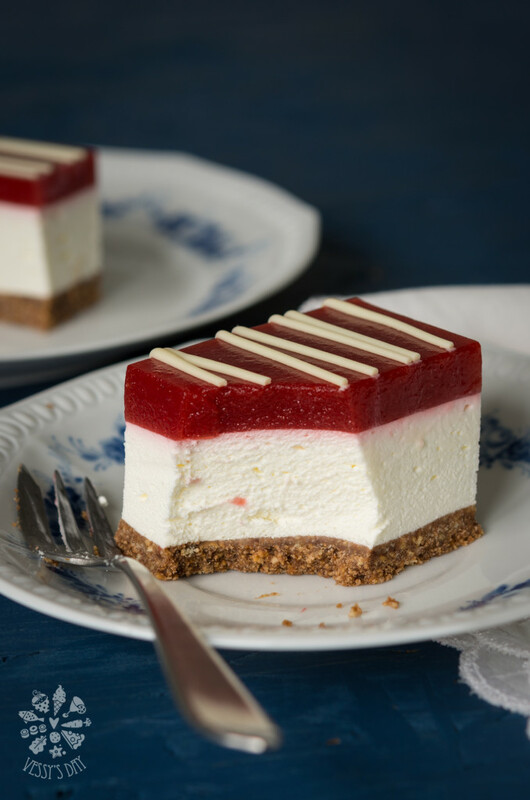 Pour strawberry mixture over the cheesecake and place back in the fridge to cool completely for about 4-6 hours. Before serving, drizzle some white chocolate on top. I really like your photos – I cannot wait to try this recipe. This looks great! I have been asked to make a cheesecake for a friend’s birthday soon and really wasn’t looking forward to turning on the oven, so this is just perfect! Thanks for sharing. Thank you, Francesca! Have a lovely weekend!